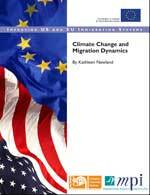 The impact of climate change as a driver of human migration is expected by many to dwarf all others. Still, certain frequently repeated forecasts of the number of people who stand to be displaced by climate change are not informed by a complete understanding of migration dynamics. Displacement is almost always the result of a complex mix of factors: a combination of exposure to natural hazards, poverty-related vulnerability, and resilience (through adaptation) determine which regions and societies are most like to suffer negative effects of climate change. Beyond these "push" factors, family and community networks, historical ties, proximity, and ease of access all help determine where people go if they move. The most significant mechanisms of displacement are sea-level rise, higher temperatures, disruption of water cycles, and increasing severity of storms. International cooperation is essential for a successful response to climate change on three levels. Short-term responses to sudden-onset disasters come in forms of humanitarian assistance; in the medium term, global efforts should focus on building resilience through adaptation; and the long-term response should be the purposeful mitigation of global warming in an attempt to bend back the curve of climate change. Progress thus far on the mid- and long-range tasks has been very slow. However, it is vital to remember that measures to preserve or restore rural livelihoods and the natural amenities that support large urban areas can also reduce vulnerability and promote resilience and adaptation in the face of climate change.